As a result of Republicans and their failure refusal to renew the Voting Rights Act of 1965, states have drastically reduced the number of possible locations where people can vote. And no surprise, Texas leads the nation – it has closed over 400 voting locations! In Brazoria County, a geopolitical area with over 330,000 people, there are only 39 locations where a person can vote on election day. For comparison, in 2008 when the population was around 30,000 less, there were 77! In order to help illustrate the problem, I made the map directly below. Each “thumbtack” represents a polling location. Notice how many places across the county have no locations and how that major population centers don’t have nearly enough. In Lake Jackson, for example, there used to be many different locations. Now there are only two — two for a city with over 30,000 people. (Early voters had one option in Lake Jackson.) Angleton, the city next door and also a hotbed of conservatism has three locations, despite its having 33% less people than Lake Jackson. People are less likely to vote if voting requires standing in line for hours (because capitalism!) and if they can’t easily get somewhere to vote – this is especially true for people with any kind of disability, job that requires unusual and long hours, or someone taking care of children. 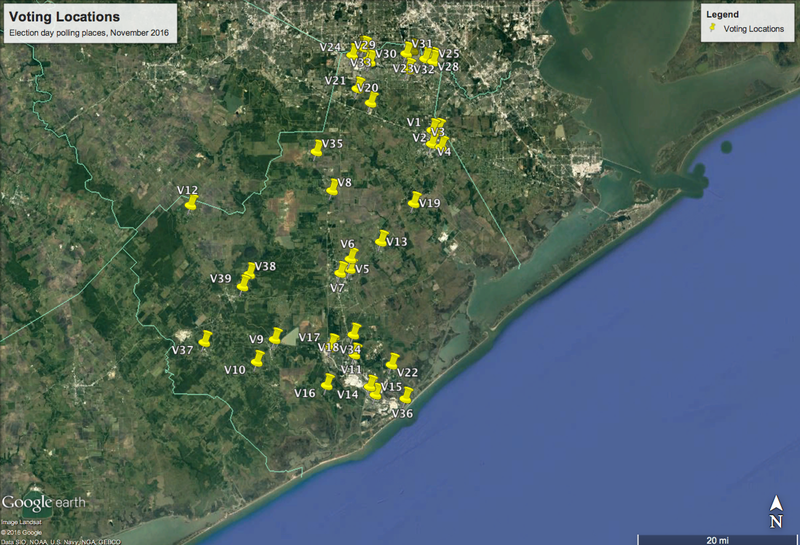 Additionally, seven of the locations in Brazoria County are churches. No one should be required or allowed to vote at any kind of place of worship. We know, for example, that simply asking someone to fill in a “male” or “female” bubble on a questionnaire, prompts all of those participating to alter their answers in different, more gendered ways. This too is voter suppression.